Sometimes after a long day, you don’t necessarily want to play a hyper-competitive, logic-based, fast twitch fighting or shooting game. Sometimes you want to just chill. The Animal Crossing series has always been good for that, but the recent 3DS release Animal Crossing: Happy Home Designer might be the most chill game Nintendo has ever devised. 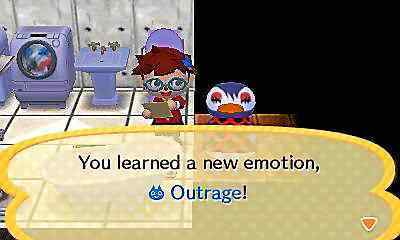 The Animal Crossing series is an easygoing life simulator that takes place in a world of cute, cartoony animals living in a small town together. Happy Home Designer effectively takes one aspect of the those games and distills it. This time the focus is strictly on designing and decorating homes and businesses of your sleepy little town. You play as a recent recruit to Nook’s Homes, owned by the series preeminent businessman, Tom Nook. You’re tasked with helping villagers pick wallpaper, carpeting, furniture, and decorations for their new domiciles. This is not the Animal Crossing version of HGTV. As there is no money in the game, you can choose whatever furniture you like to decorate animals’ homes. Your clients will make specific requests for themed rooms, but they seem to be just as happy with whatever layout you decide. You can take as long as you like and cram a room with ugly lamps or toilets, the villagers will tell you how great their new house looks, whether they mean it or not. You’ll have the chance to build more than just houses. The town government will task you with building things like schools or hospitals as well, and some villagers will ask you to design the outside of their house. There’s a greater emphasis on choice and customization in Happy Home Designer than in previous Animal Crossing games. You have more freedom to design your character this time around, letting you pick hair and facial features from a menu instead of asking you questions about your personality to determine your appearance, as the previous entries have. Bundled with the game is an Amiibo card that can be scanned into your Nintendo 3DS, either by using one of the recently released New Nintendo 3DSes, or by connecting it to a Nintendo NFC Reader/Writer device, which comes bundled with some copies of the game. These cards are also sold separately, adding a collectible aspect alongside the game. Using the Amiibo Telephone in the game, you can call up characters based on which cards you have. Each character is a new client you can work with, expanding your play options. While you can buy different packs of cards to try and collect a complete set of villagers, Nintendo probably intended these to be traded amongst groups of friends to add a social aspect to the game. Unlike other Animal Crossing games, you won’t spend an infinite number of hours making money and improving your town. There’s a definite end to the content, as you’ll eventually finish constructing your town. And because there’s no real-time clock like the other Animal Crossing games have, you won’t be compelled to wake up at strange hours to hunt for a specific piece of furniture. Even while the original Animal Crossing was a very laid back game, this one is especially relaxed, with no stakes for your cute little avatar, and no way to fail. But that’s not necessarily a bad thing. When even mobile games that advertise themselves as casual inspire a players to spend huge amounts of money just to push the button on a Skinner Box more efficiently, it’s refreshing to see Nintendo sometimes still making games that are this easy going, and never hit the player up for more money. As far as low-impact games for decompressing go, this is one of the best. Animal Crossing: Happy Home Designer is available on the Nintendo 3DS for $39.99. Additional packs of Amiibo cards are $5.99 each. Nintendo provided a copy of the game for the purposes of this review.